What are the Three Phases of Grow Op Remediation? Interested in Buying a Home in Calgary? Click Here. 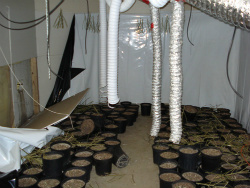 In the first post in this series we talked about what a remediated grow op is. In this video below I explain what the three phases are in terms of a former marijuana grow operation that is undergoing the remediation process. We have to understand that the remediation process is lengthy and costly. This is something that a contractor or a 'home flipper' probably would not want to undertake without experience with these types of properties. As a result of the cost of remediation(upwards in some cases of $100,000), we see a lot of people that owned these homes, typically landlords, wind up going into foreclosure because the tenant turned their property into a drug house and now they can't afford to fix it. Of course in other cases...it was the owner of the home and now they are in jail and their home was seized as being used in proceeds of crime and of course is being sold off in a judicial sale or even foreclosed on by the lender or insurerer. We see these types of homes in various states, from the home that is not available to be viewed without proper breathing equipment to the home that has been completely renovated and is 'ready to live in'. In the video below I explain the three phases in a little more detail and in around the 2 minute mark.